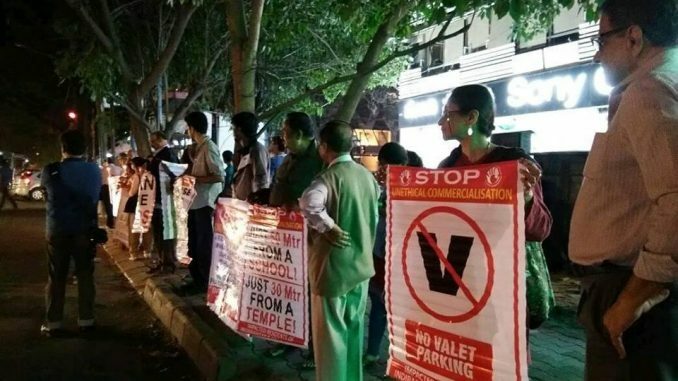 The residents of Indiranagar have been dealing with the fall out of rampant and unplanned commercialisation in their area for a few years now. With a number of bars and pubs opening up in arterial roads, the problems have only multiplied. Most of these establishments are concentrated around CMH road, 12th Main Road, 100 Feet Road and 80 Feet Road. Parking woes, overstretched utilities, loud music during nights, drunken misconduct – the list was endless. So while many Bengalureans preferred to head to Indiranagar for a night out, it had become a nightmare for those who lived in the locality. But 2017 was the year when the boil came to a spill when the residents had finally had enough. Their grouse, especially against the illegal rooftop restaurants and pubs, saw them gherao the Joint Commissioner, BBMP of Bangalore East, till he finally shut down a couple of them (even if it was for a day). The timeline for this problem is quite old. The number of bars and pubs in Indiranagar and CMH road has steadily grown in the last decade creating a law and order situation too at times. Police raids for drugs often made headlines previously. Most of these establishments did not have licenses to run rooftop bars in residential areas and were essentially single dwelling units which were converted into commercial establishments. Most of these properties were secondary holdings as a form of investment, for their owners who live elsewhere and rent these spaces out for additional income. For years the residents and RWAs had been making representations to various authorities. In the last two years, I Change Indiranagar, a conglomerate of eight of the 15 registered RWAs has been on this problem along with the others. “We have a senior citizen who is almost 80, living across from one of these pubs who does not remember the last time he had a good night’s sleep. We have filed complaints with the BBMP, Police, Excise and every other department we could think of. We have met the elected representatives, who would either give us assurances or blame the person above him. Yet no action was taken against them. In just the last one year, we have filed more than 60 individual nuisance complaints with the court. We have held protests. Some of the residents were even warned by those with a stake in these establishments about making trouble for them,” remembers Sneha Nandihal, a member of I Change Indiranagar. The rooftop businesses made life miserable for the residents who lived in close vicinity of these pubs. The pulsating music carried into the wee hours of the morning has meant sleepless nights for its neighbours. With the revelry of the the New Year looming up on the horizon, the beginnings of 2018 didn’t seem very happy the residents. “We had enough. So we surrounded the Joint Commissioner of Bangalore East, demanding that he take action a couple of weeks before new years.” says Sneha. Their pushy tactics worked too. The official finally came on ground and pulled up the Health department and immediately shut down two rooftop restaurants which were operating without a trade licence – Jonah’s and Fatty Bao. Tippler on the roof, another rooftop restaurant was also shut down following orders from the Court. Patrons of Humming Tree, a popular space for stand up performances, also cancelled its events for that time. The residents had prepared a list of 24 such establishments with rooftop restaurants including some of the most popular watering holes in the city – Sly Granny, Vapour, Hangover among others. Following their lead, the residents of Koramangala too held similar protests asking the authorities to take action. But the pubs were back in business in a couple of days, with the owners asking for time to set their affairs straight, even as the lucrative New Year’s eve was just around the corner. The residents then headed to the cops for preemptive measures. “We asked the Additional Commissioner of Police to take cognitive action to help deal with the rush that was expected. There was a clampdown reported in the Central Business District celebrations, so we expected that crowd to be divided into other preferred destinations and Indiranagar is a popular choice” said Sneha. Ensure that no parking was allowed in the bylanes or residential areas around these establishments. Ensure music did not exceed beyond 45 decibels post 10pm as per the orders of the Supreme Court. Take care that no revelry spilt onto the streets creating a law and order situation. No illegal rooftop restaurants were allowed to function. The cops decided to have police booth in at regular intervals on 100ft road and 12th main, increased their patrolling by police in the bylanes, installed CCTVs in all pubs and bars to ensure that they did not exceed their capacity. This was especially important in the wake of the tragedy in Mumbai, where a fire at an illegal rooftop restaurant killed its patrons. While no law and order issues were reported from the area (though there were cases booked for drunken driving), it was a party at Indiranagar even with the restrictions in place. While the rooftop restaurants were in full swing, the sound decibels were almost non existent from them. Karnataka Tourism Vision Group gave some recommendations to the Karnataka Government in 2014. What were the proposals? Read it all here. What happens when a couple of otherwise dirty and under-utilised pedestrian subways are given a makeover? They transform into the city’s newest public venue for music and arts.